A key sensor had been wrecked, possibly by hitting a foreign object, according to four aviation experts and two U.S. officials who were briefed on the flight data. As soon as the pilots retracted the flaps and slats, according to flight data, the sensor began to feed faulty information into the Maneuvering Characteristics Augmentation System (MCAS), designed to prevent stalls. Moments later, the Boeing (NYSE:) Co jet hit the ground, killing all 157 people onboard after six minutes of flight. That would be an unusual step in a regular flight, according to four experts and five current and former pilots interviewed by Reuters, most of whom were not authorized to speak publicly. By the end, the aircraft was traveling at 500 knots (575 mph, 926 kph), far beyond Boeing’s operating limits. A sudden spike in black box data was consistent with a bird or other debris hitting the plane as it was taking off, shearing away a vital airflow sensor, said the four experts and two U.S. officials. 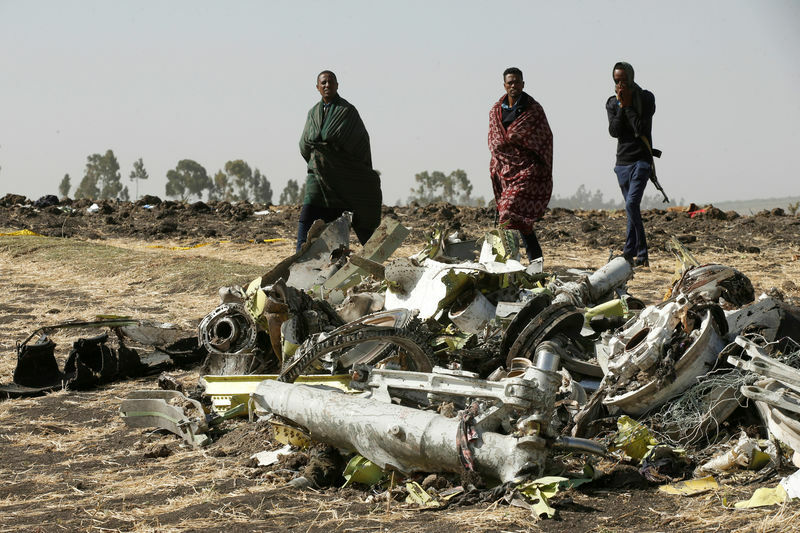 The first time the MCAS software kicked in, flight data shows the Ethiopian Airlines pilots reacted quickly by flicking switches under their thumbs – they had recognized the movements as the same type flight crews had been warned about after the Lion Air crash. But data shows they were not able to fully counteract the computer’s movements. At that point, they were a mere 3,000 feet above the airport, so low that a new warning – a computerized voice saying “don’t sink” – sounded in the cabin. This time, the pilots countered MCAS more effectively, the experts said after studying the data. But when they turned off the system – as they were instructed to do by Boeing and the U.S. Federal Aviation Administration (FAA) in the wake of the Lion Air disaster – the nose was still pointed downward, leaving the jetliner vulnerable. As the nose gradually fell, the captain asked the co-pilot to try to trim the plane manually using a wheel in the center console to help the plane recover from the dive, according to the voice recorder.